I did something today, which I do not often do. As I was acquiring items for my work I stopped and did a quick shop for art works. And I purchased something which, for me, is odd. I have no others in my collection but may possibly add in the future. I purchased a poster. Big let down right. Well perhaps not, for this poster is an antique. It is an advert for Mazawattee Tea. 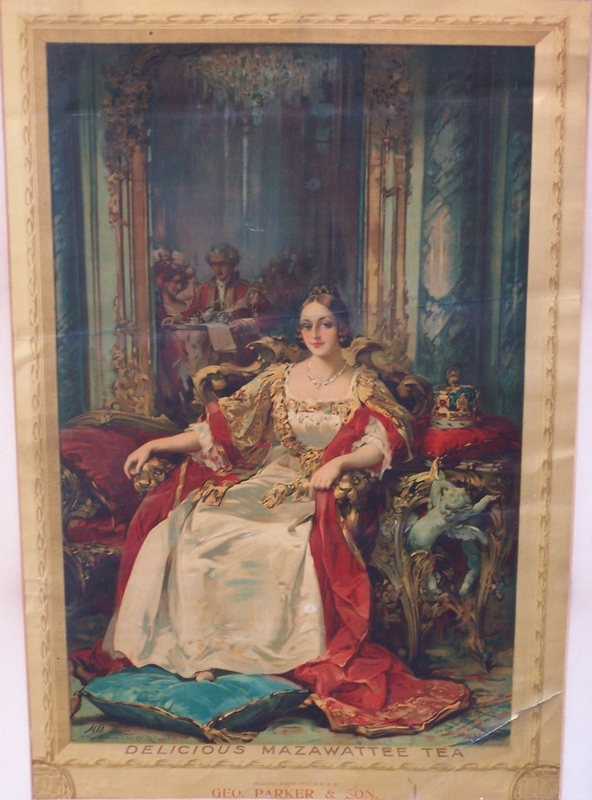 It portrays the newly crowned Queen Victoria (1819-1901) sitting on her throne and in the mirror behind her you see the image of a butler bringing to her her cup of tea. In the bottom right corner of the poster it reads ‘ It is said that her majesty’s first command on ascending the throne was “Bring me a cup of Tea and The Times.” A little bit cheeky but what a way to advertise your product. Using the Queen – really! The monarchs of England have at times allowed their likeness to be used in advertising but this is very in your face. A royal seal of approval or recognition for any company would increase their overall worth tremendously. I wonder if the Queen was paid for the sitting or did she just get tea. Lots and lots of tea. The Mazawattee Tea Company, founded by the Densham family, was one of the most important and most publicised tea firms in England during the late 19th century. In the 18th century, tea had become an important drink in Britain. The Densham family were leaders of the tea industry expansion. They moved to London from Plymouth and managed to amass a fortune in quite a short time. The poster which the company used for many a year consisted of a grandmother sitting with her grand-daughter having a cup of tea. The slogan ‘Delicious Mazawattee Tea’ prominently placed for all to read. At least the slogan is placed below the Queen in my poster and if you didn’t know it was there this poster would just be a lovely portrait of the Queen. So let us welcome peaceful ev’ning in. This entry was posted in Modern prints and tagged butler, cherub, crown, cushion, mirror, Queen Victoria, tea, throne. Bookmark the permalink. Hi, did you get any more information on this? I have not found any other information on the piece nor have I seen items like it for sale. So no real idea of value.